Me with one of my creations! I think its important that, as druids, we work to build sacred spaces within the landscape. Yes, many would say that all land is sacred, and I’ll not disagree. But at the same time, there’s quite a difference between a parking lot or a strip of land between two segments or highway and a quiet forest glade or a stone circle set upon a hillside overlooking a river. 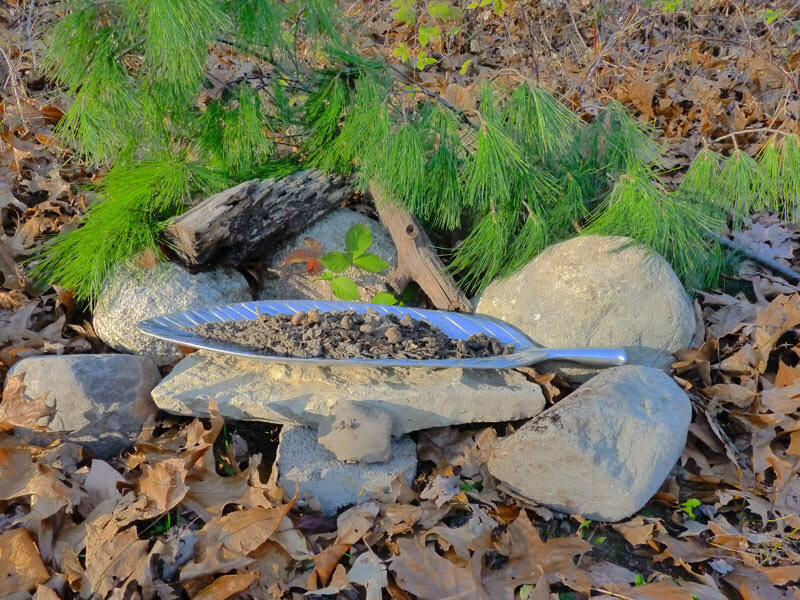 Whether in your own home garden, in a corner of a local park, or in the forest behind your workplace, you can build and maintain small sacred spaces that can provide peace, restorative energy to you and the land, demonstrate reverence and respect. 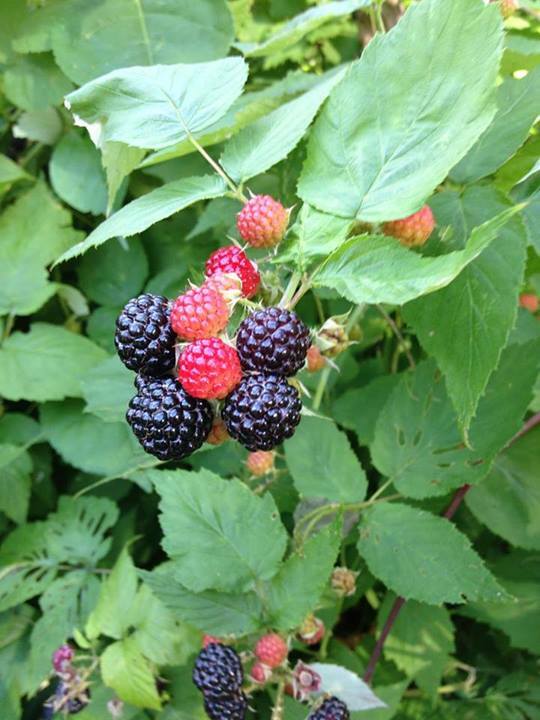 In my own property and in other wild places I visit, I’ve been working to build small natural sacred spaces and wanted to share my experiences and insight. This post is meant to be the first in a series; I will detail other building techniques in the next few months. Some of these will include a set of smaller projects that you can undertake in as little as 10 minutes or larger projects which may take days, weeks, months, or years to complete. The first “Sacred Space” building technique that you can use is building stone cairns, also known as stone stacking, stone building, or stone balancing. The art of balancing stones has origins in many cultures. In many parts of Asia, stones are balanced and stacked as a sign of prayer and meditation. In North America, native Americans used stone cairns to watch over animals and forests while humans were not present. As druids, we often meet among stacked stones (such as the OBOD events at Stonehenge each year) or in stone circles. I see stone balancing as a kind of natural poetry–an aesthetic that is difficult to put into words. When we balance stones, we connect the depths of our souls to the depths of the earth and create something of beauty and harmony. What do the stacked stones convey? Ask them, and you may find out. Stone balancing is a very simple, yet profound activity. Stone balancing allows you, at its core, to connect with the ancient energies of the earth. As you stack stones, you can enter a deep communion with the land, a kind of movement meditation. You might begin stone balancing by simply seeing how stone A stacks upon stone B and stone B stacks upon stone C. Try these kinds of stacks for a while, and once you get the hang of simple stacking, you might want to try more complex stone stacking, where stone C depends upon both A and B, or where B and C need each other to sit atop A. When I started stone balancing, I made stone stacks very simply with the larger, round stones found so commonly in south-east Michigan. 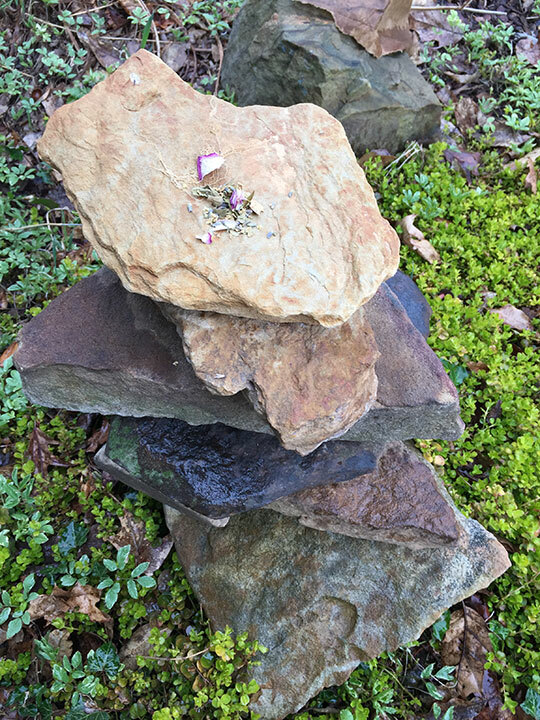 I have several active stone stacks in my yard which I maintain–these simple stacks of rounded stones would fall over each time the weather changed by more than 20 or 30 degrees. But over time, I started adding complexity to my stone stacks–when small pebbles were added between the larger stones, I created a more solid structure that can withstand the changing seasons, wind and rain. I also began experimenting with different kinds of stacks and designs, such as the design I’ll call “Thor’s gate” and the “Yggdrasil” designs in the photos. 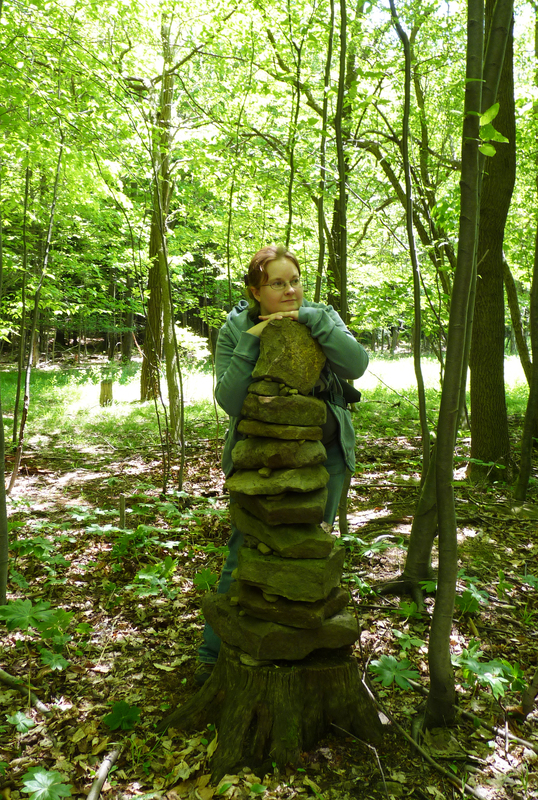 When I went to Western PA (which is where I grew up), I found that the rocks there were much more conducive to stone building–nice, flat rocks allowed me to stack in many different patterns. 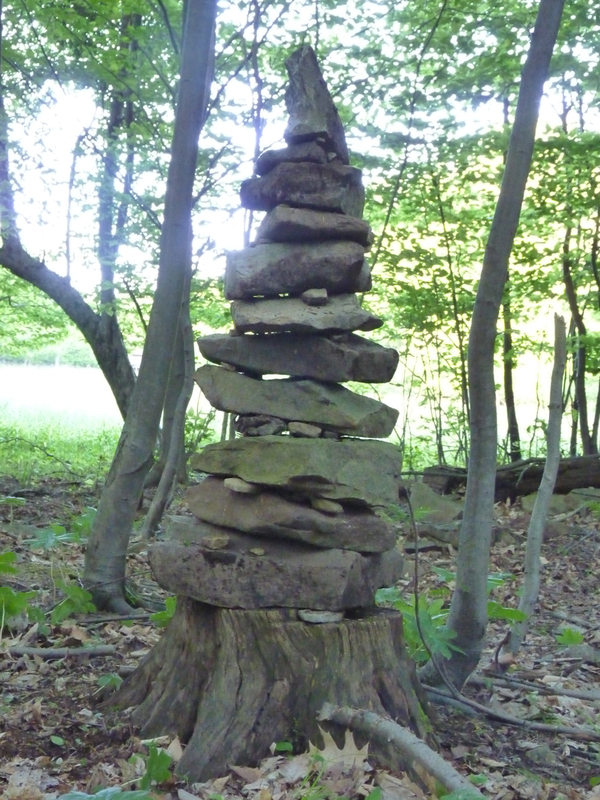 Most of the cairns I am posting on this blog are from PA, where the stones love to be stacked! When you are working, its important to pick out a good site to begin. Something that is firm for a base (a stump, a stone in the ground, a bit of flat earth with the leaves cleared away). You should also start with an ample supply of good stones in the area (for the reason, building stone cairns nearby or in rivers/streams is an excellent activity). As you are working, let the shape of the stones determine how you work with them–they will speak to you and the stone building will just flow. I have found stone balancing to be a wonderful activity for both my own property and for visiting natural areas and leaving a tribute. In my own property, I build them in different parts of the property as altars/shrines. 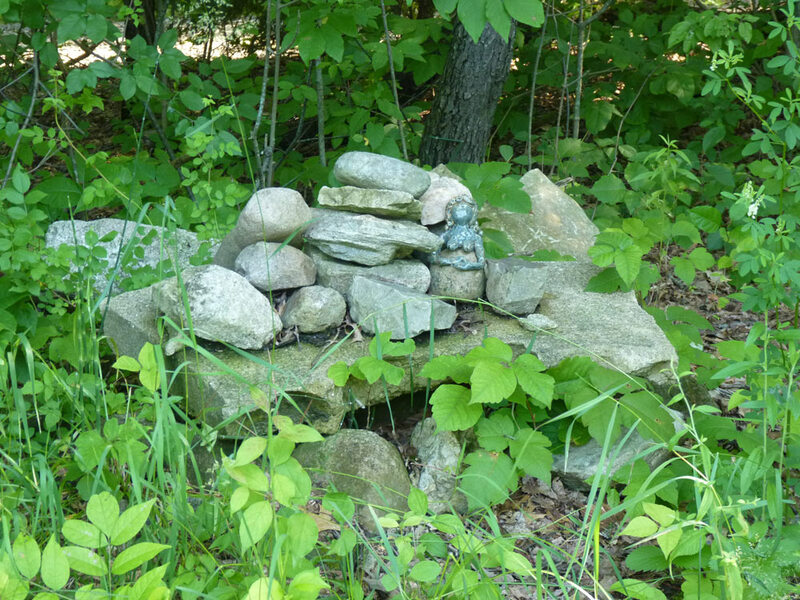 For example, a stone cairn I maintain every day is my “Shrine to the Fallen” which sits on top of a white pine tree stump from a tree that was cut before we moved here. This shrine, aptly named, reminds me each day of the ongoing struggle our planet and our lands face; the trees cut in the name of “human progress” and the species threatened with extinction. In addition to the stones, I add symbols of rebirth and renewal such as pine cones and evergreen boughs to this shrine. 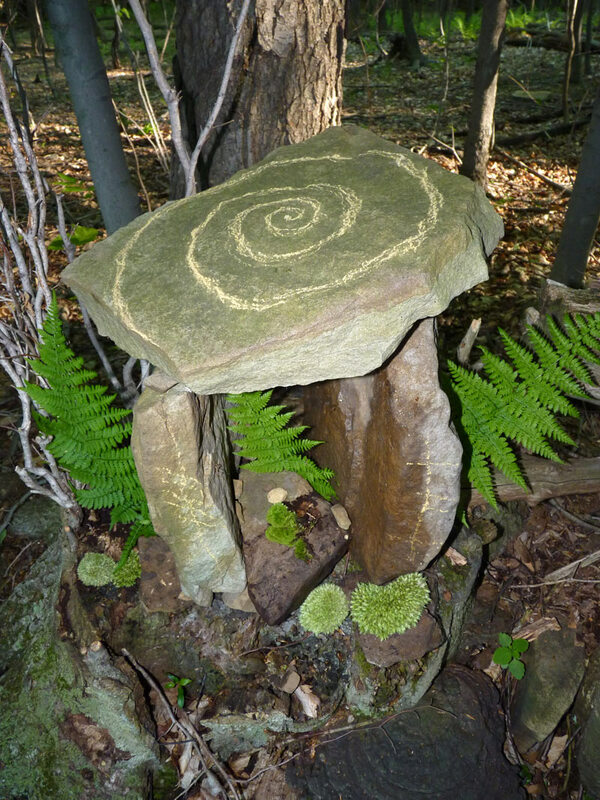 A second stone cairn is a set of numerous stone stacks near a large oak and series of smaller sassafras trees, which I also maintain daily as a “Reverence to the Land” shrine. This shrine is where I might leave some seeds or pumpkin cakes as a “thank you” to the earth which provides all. A second activity involves building stone cairns on public land where I am visiting: state parks, local township parks, along city walking paths, etc. Make sure you aren’t disrupting local wildlife with your stone building. I have some stone cairns that I return to often or once a year, and some that I build and never come back to again. Sometimes, I have found that if you build an impressive enough and visible enough cairn, others may add to your stone cairn or build others around it, creating a kind of shared poetry. 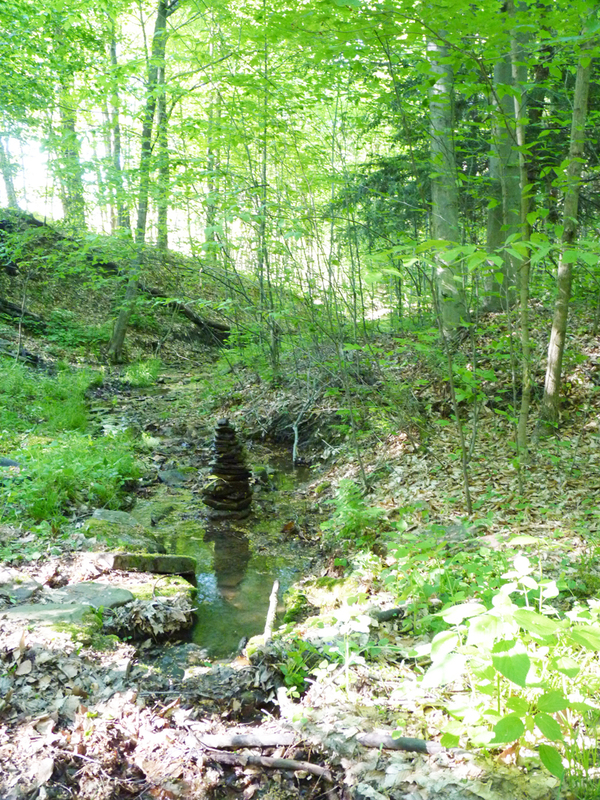 I have found great joy in building stone cairns in streams or along riverbeds. 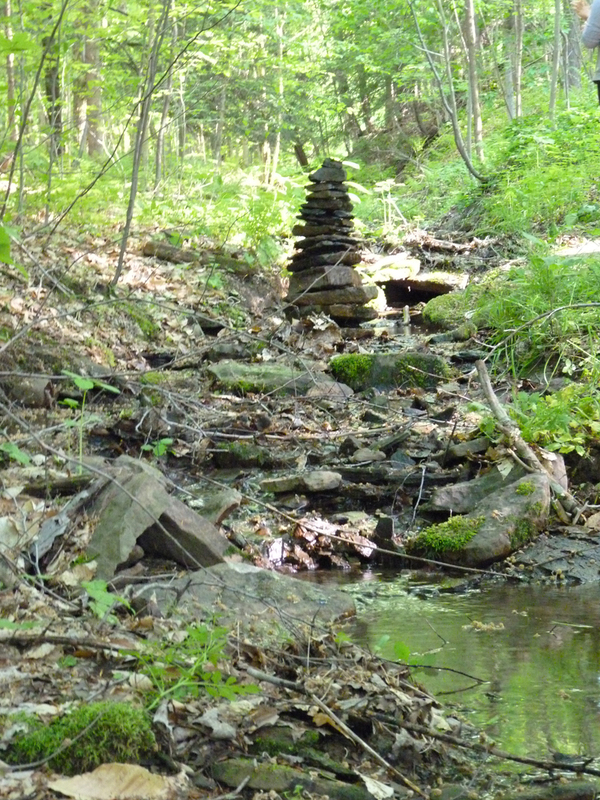 Recognize that spring rains and swollen rivers will eventually wash your cairns away; however, there is something inherently magical in seeing a stone cairn sitting in the middle of a tranquil brook. If I had come upon this stone cairn without knowing it was built by human hands, I would have thought that it rose up from the earth on its own. The earth had built it just to communicate with me. I go hiking often, and many trails have these cairns as markers. So I see this cairn as something that helps guide you along your way. I see it as a place for the energies of the forest to converge. A focus point. I also see it where the water and the earth meet. My own intention was that the cairn was built to revere and respect the land. But the beauty of the stone cairn is that it allows for many kinds of interpretation and communion with the natural world. I hope that you will be inspired to post your own stone cairns! And if so, please post in the comments and share some of your work and experiences.